This 7-day festival takes place during the full moon period of the third lunar month, generally in late February or early March, and is centred on the revered shrine. Religious meritmaking, folk entertainment and native bazaars number among activities attracting pilgrims hum northeast Thailand and neighbouring Laos. This occurs in the provincial capital and forms part of the celebrations marking the end of the annual 3-month Buddhist Rains Retreat. Celebrated in late October, during the period of the full moon, the 7-day festival commemorates the occasion when the Buddha returned to Earth after preaching to his mother in Heaven. People traditionally showed their respect by illuminating their boats. 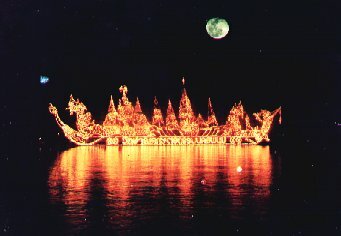 During the festival, there are dragon-boat races on the Mekong River, frequently featuring Thai and Laotian teams, and the festival finishes with an illuminated boat procession in which model bamboo boats are decorated with lights. People from many villages in each Amphur of Nakornphanom join the tradition. 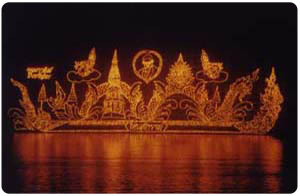 On full moon night in October every year, the people will launch a Rua Fai (an illuminated boat) in the Maekhong River. A rua Fai or Hua Fai (in Nakornphanom dialect) may be made of banana trunks or bamboos. The material was bound together to make an at least 5-meter-long boat. Some sweets (khanhom) and offering will be put on the boat. On the boat trunk, joss sticks, flowers, candles or small lamps or resin torches had been decorated. Before the launching, candles or lamps or resin torches will be lit. For this tradition, a Hua Fai will be launched at 7 p.m. one after another. In Buddhism faith, a Rua Fai launching means paying respects for Buddha. The tradition commemorates a Buddhism great day. The day when Load Buddha went to heaven to preach his doctrine for his mother. 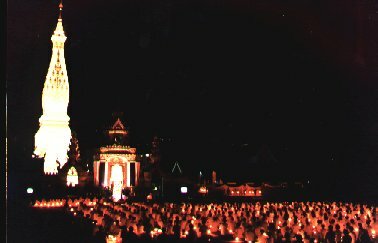 Suang Hua is an another ancient tradition for Nakornphanom. The purpose of the tradition is to gather the people from every Amphur and for folk recreation. Every Amphur sends a racing rowboat to join the racing. The racing will be help for three days during the Lai Fai Festival period. This is the longest, hardest way and hardest day for the rowers in Thailand because the racing distance is about 2 kilometers. Nakornphanom joins Suang Hua for more than a century and furthermore some boats have been used for 100 years. There are two kinds of boat for this racing. The shorter accommodate 35 rowers and the longer accommodates 45-70 rowers. The race will be help on 9.30 a.m. to 3.30 p.m. There are two teams in this race - male teams and female teams. The aim of this dancing is to pay respect to the shrine. The song of this dancing was first written in poem later in was adopted to be this dancing song. 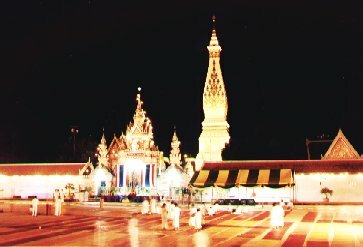 The song depicts the legend of Thatphanom shrine construction in the early period. This dancing is usually done on occasion of annual Phra That Phanom Pilgrimage Festival which hold in late January or early February for purposes of veneration, meritmaking, and recreation. The dancing have been displayed in Lai Rua Fai Festival (Illuminated Boat Procession) since 1988. It is said in ancient history that in the 6 th century B.C. Sri Kotaboon Kingdom, which was situated roughly in the area of the present day Nakornphanom province and adjacent part of Laos was very flourishing. In order to reca the flourish of the kingdom in the past, the dancing is invented to dance for some occasions of annual important festival. The dancing is derived from Rum Serng Dancing and Phu Thai Dancing integration. "Phuthai" is the name of a tribe of people who are living in Renoonokhon district and at some villages in that-Phanom and Nakae district.This kind of dancing is developed from deity worshiping dance and annual festival dance. The former is done on occasion of annual festival which hold during May and June in order to seek blessing from great deity as believed in ancient time, while the latter is done in a temple on occasion of important Buddhist festivals which usually hold in April and May for purposes of veneration and Meritmaking. "Thai Yor" is a tribe of people who are living in Tha-Uten, Nava and Phonsawan district.The Thai-Yor Dancing is usually done on occasion of "Songkran Festival" which hold on 13-15th April of every year. In day time people bring scented water to pour on Buddha images in order to seek as champac, frangipani from their own places to temples to offer to Buddha images. After the worship is over, the dance is conducted at the temples.